What attracted you to the breed? After having a Rottweiler previously I wanted to explore other breeds that were smaller but still a large breed. I also wanted a breed with a short coat as well as a breed that was more athletic. I started researching the breed and found I liked a lot about it. I also had a austrailian cattle dog and wanted to explore a sporting breed rather than a herding breed for my next dog. 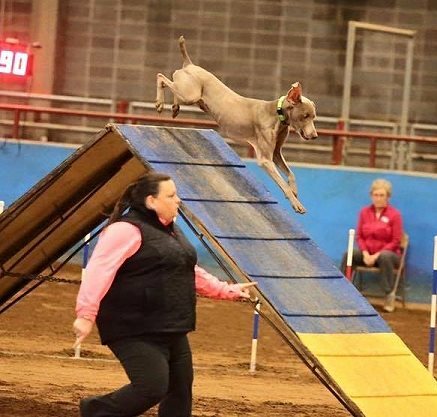 What activities do you currently participate in or hope to participate in with your Weimaraner? I currently compete in agility very regularly and normally part of the committee for our local trials and any Natl events I attend. I also participate in tracking events by either being the chair of our local tracking test, secretary or track laying. I have also competed in obedience earning a UD as my highest level. I also show my dogs in conformation. I have 2 CH and 1 GCH sleeping in my bed besides my very tolerant husband :-). I also have competed in field trials, ratings test and have also chaired and competed in Hunt test but much more sporadically. 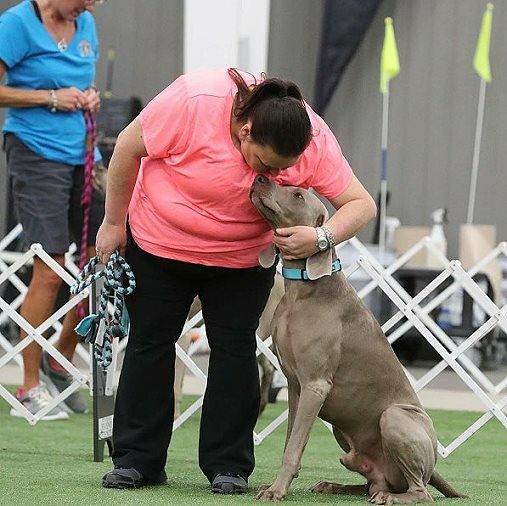 What is your proudest moment with your Weimaraners? 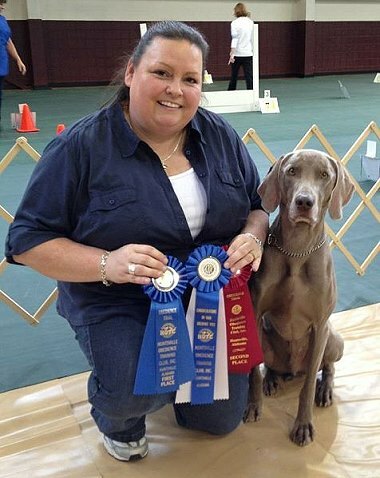 I can't name just one but my first weim Trevor that I bought out of the newspaper was a pretty great dog and he introduced me to the world of weimaraners and to competing in dog sports. We went from Novice A in agility all the way to MACH4, we also earned a CDX and some ratings titles. He taught me so much and introduced me to so many. My next weim Streak came from a reputable breeder and that dog was born to compete. I started training him in obedience and knew right away we had a connection like no other. We ultimately earned a UD title which was very rewarding to me as he trusted me and I trusted him. He also took me on a very long and rewarding journey in agility earning a MACH5 and was always my faithful partner in life and all things dog sports. The bond with both of these dogs were life changing in so many ways. What is your funniest experience with your Weimaraners? I think the funniest experiences with my boys are the couple of times I took a spill while running agility and I'm laying on the ground trying to get up and they are trying to figure out what the heck I am doing. First of all let me say I am not normally a clutz at all. I can count on one hand the number of times I have fallen while running agility in the last 16 years but wouldn't you know it has happened to me twice at our National events, EMBARRASSING! Both times Trevor thought I was crazy but kept right on working, we still laugh about that today as I have friends with long memories. Things you like to do in your spare time? I pretty much hang with my boys either training or doing something fun. My husband and I are Tennessee Titans fans and have season tickets so regularly go to football games. Something people would be surprised to know about you? : Before weimaraners I had horses and spent pretty much every spare weekend hanging around the barn and riding. Trail riding was probably my most relaxing thing to do with my faithful Australian cattle dog Mack always at my side. 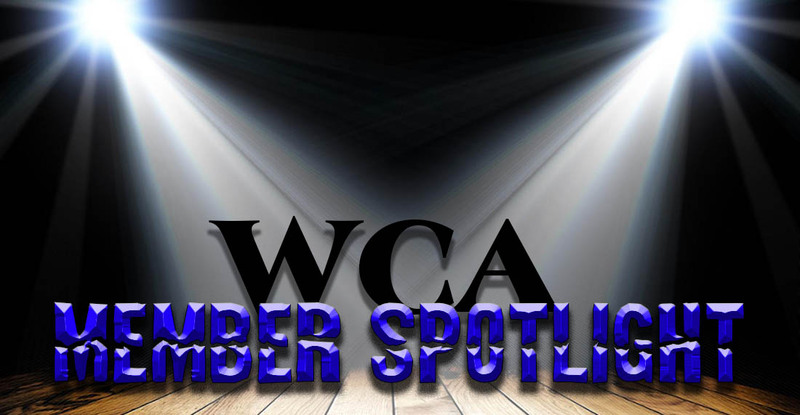 Would you like to become a part of our member Spotlight?